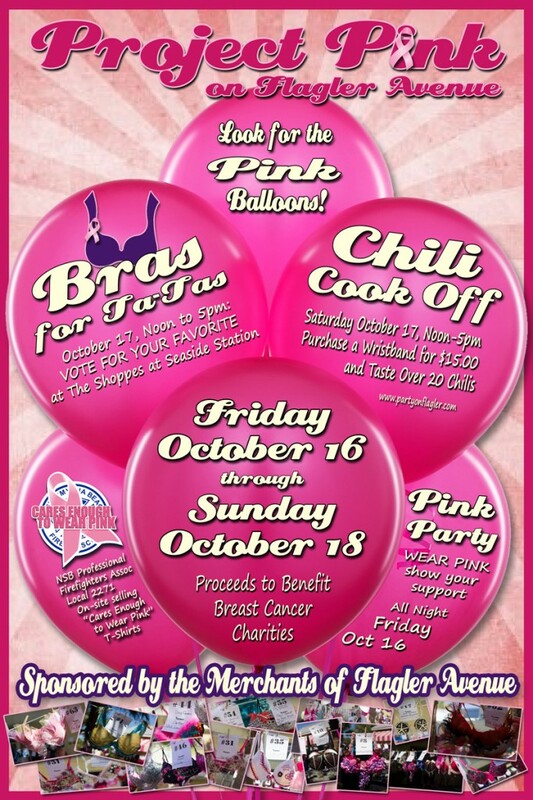 Project Pink raises money for breast cancer charities with Chili-Cook Off and Bras for TaTas October 16-18, 2015. Show your support for Breast Cancer Awareness at our ”PINK PARTY” on Friday, October 16 starting at 8pm. Simply come out on Flagler Avenue, eat, drink and be merry in your finest pink! Then come back Saturday for the big day with a Charity Chili Cook-Off from Noon to 5pm with 100% of the proceeds going to breast cancer charities. We also have a Craft Beer Walk going on at the same time (after all what goes better with Chili than beer?) Stop by the Shoppes at Seaside Station and see the Bras on display all designed and donated by local residents and businesses. You help us raise money and awareness by voting for your favorite bra or purchasing on one. Sunday attend the 11am mass at Coronado Methodist Church said in honor of the individuals and families dealing with Breast Cancer and those who have passed. Join us as we kick off the Project Pink weekend with a Pink Party. Come dressed in your funniest, craziest, cutest pink attire in a celebration of life and awareness for those battling Breast Cancer. Don’t have anything pink? No worries, New Smyrna Beach Professional Firefighters Local 2271 will be on hand selling their “Cares Enough to Wear Pink” T-Shirts. Also from Noon to 5pm is the 7th Annual New Smyrna Beach Chili Cook-Off at inside locations along Flagler Avenue. 100% of your $15 donation for this event will go The Save the TaTas Foundation and Susan G Komen for the Cure. For your generous donation you will receive 2oz tastes of over 20 homemade chili’s from NSB’s local restaurants. Vote for your favorite in our “Best on the Beach” awards. New Smyrna Beach Professional Firefighters Local 2271 will also be on hand with their “Cares Enough to Wear Pink” wrapped fire truck parked on Flagler Avenue. They will be located inside the courtyard serving up their award winning chili (they won last year) and selling their “Cares Enough to Wear Pink” t-shirts. Proceeds of those sales go to breast cancer charities. Attend the 11am mass at Coronado Methodist Church said in honor of the individuals and families dealing with Breast Cancer and those who have passed. DID YOU KNOW THE FOLLOWING FACTS? Breast cancer is the most common cancer among American women, except for skin cancers. About 1 in 8 (12%) women in the US will develop invasive breast cancer during their lifetime. **About 232,340 new cases of invasive breast cancer will be diagnosed in women. **About 64,640 new cases of carcinoma in situ (CIS) will be diagnosed (CIS is non-invasive and is the earliest form of breast cancer). Breast cancer is the second leading cause of cancer death in women. The chance that breast cancer will be responsible for a woman’s death is about 1 in 36 (about 3%). Death rates from breast cancer have been declining since about 1989, with larger decreases in women younger than 50. These decreases are believed to be the result of earlier detection through screening and increased awareness, as well as improved treatment. At this time there are more than 2.8 million breast cancer survivors in the United States.